Bit Tooth Energy: The UK - new Government, new Energy policy? The new British Government has moved in, and Chris Huhne is the new Secretary of State for Energy and Climate Change, Charles Hendry is the new Minister of State for Energy while Gregory Barker is the new Minister of State for Climate Change. (Interesting set of pre-government employments). This post will look at the new policy statement, relative to the recent Ofgem Discovery Report. • We will push for the EU to demonstrate leadership in tackling international climate change, including by supporting an increase in the EU emission reduction target to 30% by 2020. • We will seek to increase the target for energy from renewable sources, subject to the advice of the Climate Change Committee. • We will continue public sector investment in carbon capture and storage (CCS) technology for four coal-fired power stations. • We will establish a smart grid and roll out smart meters. • We will establish a full system of feed-in tariffs in electricity – as well as the maintenance of banded Renewables Obligation Certificates. • We will introduce measures to promote a huge increase in energy from waste through anaerobic digestion. • We will create a green investment bank. • We will retain energy performance certificates while scrapping HIPs. • We will introduce measures to encourage marine energy. • We will establish an emissions performance standard that will prevent coal fired power stations being built unless they are equipped with sufficient carbon capture and storage to meet the emissions performance standard. • We will cancel the third runway at Heathrow. • We will refuse permission for additional runways at Gatwick and Stansted. • We will replace Air Passenger Duty with a per-flight duty. • We will introduce a floor price for carbon, and make efforts to persuade the EU to move towards full auctioning of ETS permits. • Through our ‘Green Deal’, we will encourage home energy efficiency improvements paid for by savings from energy bills. We will also take measures to improve energy efficiency in businesses and public sector buildings. We will reduce central government carbon emissions by 10% within 12 months. • We will reform energy markets to deliver security of supply and investment in low carbon energy, and ensure fair competition including a review of the role of Ofgem. • We will instruct Ofgem to establish a security guarantee of energy supplies. • We will give an Annual Energy Statement to Parliament to set strategic energy policy and guide investment. • We will deliver an offshore electricity grid in order to support the development of a new generation of offshore wind power. • We will encourage community-owned renewable energy schemes where local people benefit from the power produced. We will also allow communities that host renewable energy projects to keep the additional business rates they generate. • As part of the creation of a green investment bank, we will create green financial products to provide individuals with opportunities to invest in the infrastructure needed to support the new green economy. • We will work towards an ambitious global climate deal that will limit emissions and explore the creation of new international sources of funding for the purpose of climate change adaptation and mitigation. • Liberal Democrats have long opposed any new nuclear construction. Conservatives, by contrast, are committed to allowing the replacement of existing nuclear power stations provided that they are subject to the normal planning process for major projects (under a new National Planning Statement), and also provided that they receive no public subsidy. – clarity that this will not be regarded as an issue of confidence. The big change, of course, between being in Opposition and being the Government is that the coalition how has to make the system work, as well as meet the objectives that they have now outlined. So today, taking our lead from 10:10, I commit us to a ten percent reduction in carbon emissions across central government in the next twelve months. You’ll be driving this forward. But I have also made sure all Cabinet ministers are involved, developing plans to show how they will meet their share. “And the public will be involved too - because we're going to publish the energy use of government headquarters in real-time, so people can hold us to account for our performance. And lest you miss which is viewed as the more critical aspect of the new Secretary’s job, let there be no doubt, since he stated his goals. Climate change is the greatest threat to our common future. We have a very short period of time to tackle the problem before it becomes irreversible and out of control. “A lot of progress has been made, but we must now go further, faster and turn targets into real change. Together we have the opportunity to make this the greenest government in our history. And to put energy security, for too long a second order issue, at the heart of the UK's national security strategy. In the United Kingdom Ofgem (the Office of Gas and Electricity Markets) regulates the monopoly gas and electricity companies in the UK, and is intended as a consumer watchdog. In March it produced a “Discovery Report”, which notes some of the concerns that had then risen with regard to future energy security. 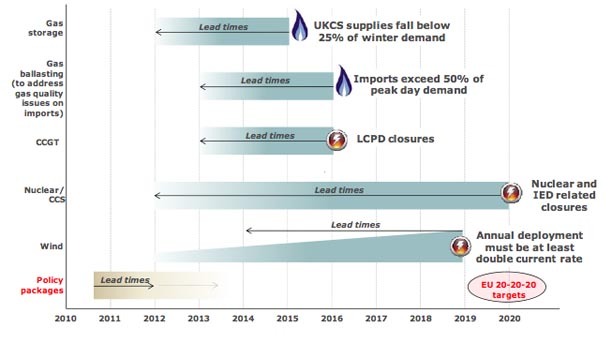 It shows, through this figure, the need for adequate lead time for many of the changes that will come about as domestic supplies fall. • The (at least) doubling of our wind deployment rate by the end of this decade that will be needed if the 2020 renewables targets are to be met. They note that this is going to require significant investment, which may be a problem given that the UK is currently anticipating making major budget cuts to overcome the deficits left by the previous government. The report calls for an investment of 200 billion English pounds by 2020, which, in context, is larger than the current UK budget deficit of 163 billion pounds, about 11% of the GDP. That deficit is leading to current plans for cuts of up to 6 billion pounds in the public sector. The first budget to more comprehensively address this will be announced on June 22nd. our assessment suggests that prices may indeed not rise sufficiently during periods of scarcity and we believe that this presents a material risk to security of supply. As a result, potential investors in new power stations could find it difficult to recover their investment costs and so may not build new plant. Some commentators suggest that this so called 'missing money' problem in electricity markets can only be addressed through separate mechanisms for rewarding capacity as have been implemented in the US and elsewhere. Others argue that capacity mechanisms are not necessary and lead to inefficiently high prices. One issue that the report highlights that I had not previously considered is that of natural gas quality. There is a significant difference, apparently between that needed in the UK for existing appliances, relative to that obtainable, for example, from Russia. 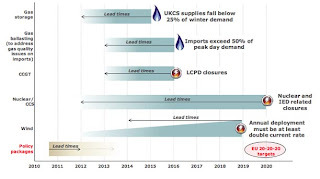 The difference in gas specification creates a risk that gas cannot flow via the IUK interconnector to the GB market. Up until now, Fluxys, the Belgian SO, has been able to manage this risk to imports via the IUK by swapping higher calorific sources with lower calorific sources or by using linepack to keep gas within the GB specification. However, there is a risk that the high specification of new sources of Russian gas and the increasing specification of Norwegian gas arriving at Zeebrugge may make it more difficult for Fluxys to provide these services. This means that there is an increasing risk that flows could be curtailed on certain days to stop "out of spec" gas from entering GB. They lead us to conclude that, in the context of the risks identified in our scenario work, there are reasonable doubts as to whether the current arrangements will deliver security of supply and environmental objectives at affordable prices. . . . . . . Ofgem does not consider that leaving the current arrangements unaltered is in the interests of consumers. That seems to be a realistic point at which to sit back, and see how the Government actually will overcome the problems – or at least try. Every post in your blog has something I didn't know. I also like David MacKay's stuff. Have you seen any of his talks from his tour of America. E.g. the CalTech one: http://today.caltech.edu/theater/item?story_id=44542 ? I guess you prefer the coal without CCS option for Britain. It's hard to see how the coalition can avoid a lights-out event in Britain with conflicting aims and inadequate finance. "I commit us to a ten percent reduction in carbon emissions across central government in the next twelve months." Since the British government is spending every penny it takes in plus another 11% of GDP which it does not have, eliminating deficit spending should take care of this. Reduced central government spending would inevitably result in reduced central government production of carbon dioxide. But Cameron is just a politician. He already reneged on his promise to let the British people have a referendum on the European Treaty. Brits would be unwise to count on any of those promised "green" jobs, or indeed any of the other promises. The horrible truth is that so-called renewables are "Subsidy Sluts", dependent on various forms of subsidies, mandates, tax rebates, and preferential pricing. A government which has run out of cash can't afford to keep subsidizing losers. And the British people are going to be suffering enough from paying higher taxes to reduce the deficit. They won't be able to afford to pay the full price for expensive inefficent low carbon "renewables". The interesting thing about the OfGem document is the pressing time scale. By the time British politicians stop posturing and start dealing with reality, it is very likely going to be too late to prevent Britain from slipping into a third world period of constant rolling blackouts. The best hope is that the French keep building nuclear power plants, and can ship enough power across La Manche to keep English pensioners from freezing to death during the winters. Though how Britain will pay for French electricity remains to be seen. Nice words, better words by far than I've seen from my national government. I'm envious. But, as you allude to in your lead paragraph, the three people in charge of climate and energy are well versed in how to come up with the right words. I agree with Kin's comment just above that the money to turn these words into deeds is going to be hard, really hard, to find without sacrifices entering the realm of the politically inexpedient. So yes, time to sit back and watch and, in my case, to wish the new government well.